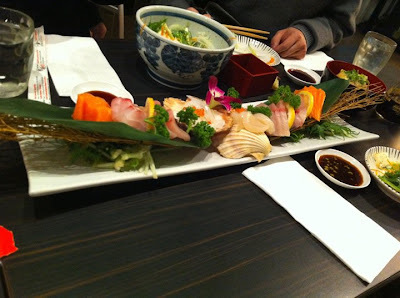 This week, we are going to explore one of the restaurants in Pyrmont that was recommended by my friend, Sushi Samurai. The restaurant looked kind of small but it’s full of people. I guess we wouldn’t make it if we hadn’t booked in advance. It’s a nice sizable restaurant but unfortunately my friend failed to tell us that there was a special menu that could be ordered one day in advance. It’s a kind of preset menu with an optional lobster. Casting our disappointment aside, we ordered several dishes that I am going to write in the order of the timing appropriateness. I dislike the fact that our main Sashimi Platter was the first one to be served. We would have been happier if our Deep-fried Lotus Roots, Agedashi Tofu, and Tofu and Seaweed Salad were the first ones to arrive. 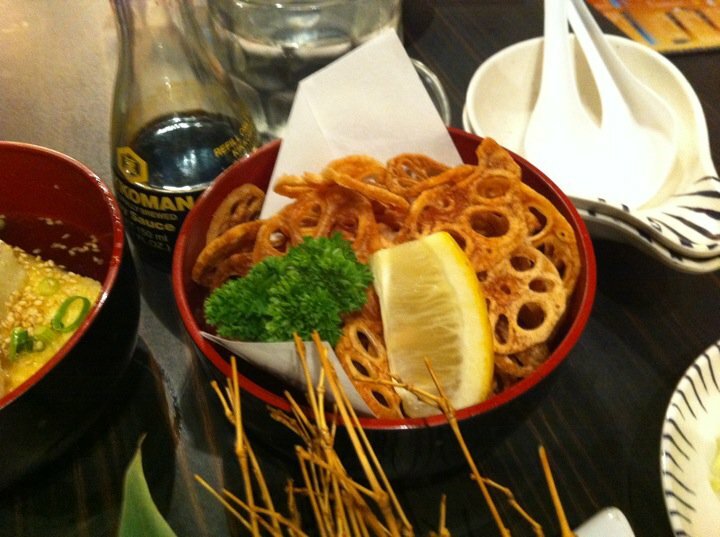 The lotus roots were crispy but it’s kind of tasteless and bland, except for a bit of salt. Agedashi Tofu was nice, but unfortunately it’s too little of a portion for the six of us. 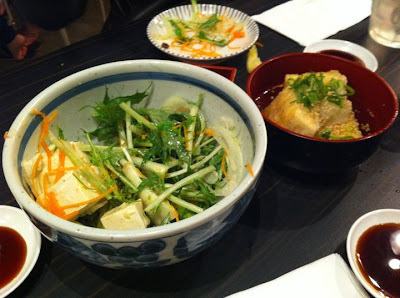 The salad on the other hand was very fresh with silken smooth tofu. There were a rich variety of vegetables in it and it had a big portion. On with the Sushi dishes… We ordered two sushi rolls this time, the classical California Roll and my all-time favorite Soft Shell Crab Roll. 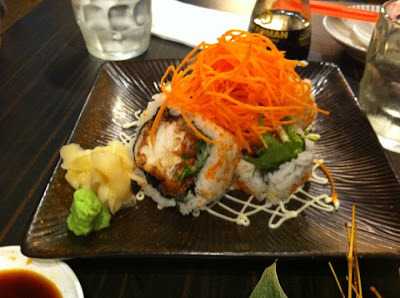 California roll was o, regular 8 pieces, but lacking in the actual quantity inside the rice. 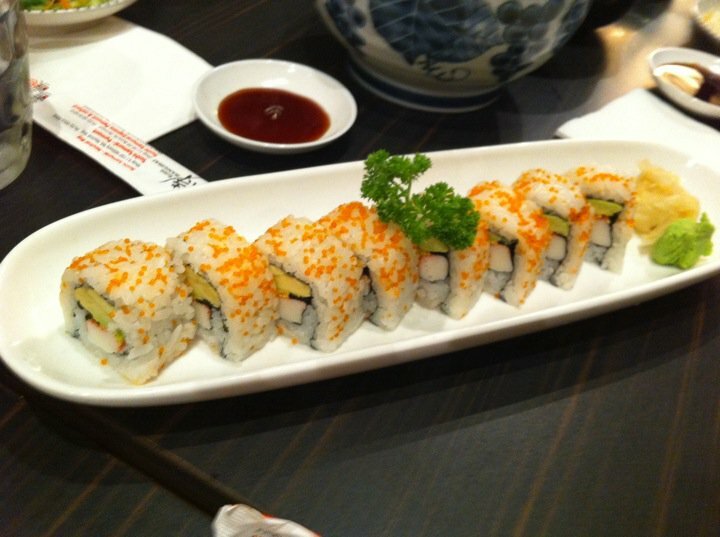 The other roll was much better presented and tasting, but it lacked the number of pieces. In the grilled department, we ordered Teriyaki Wagyu Beef and Grilled Fish Head. The beef was certainly one of the best dishes of the day. 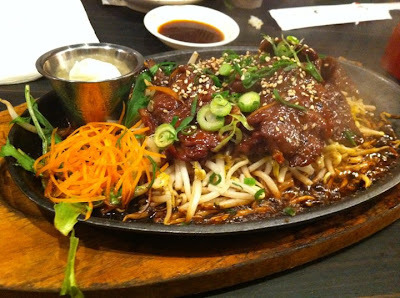 Sizzling wagyu cuts on top of a bed of bean sprouts. Perfectly combined with the sauce! The fish on the other hand was a nightmare. 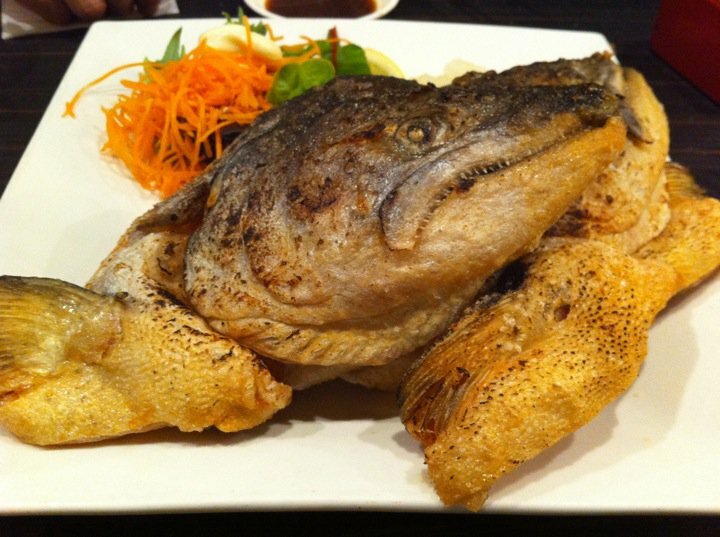 It’s true that you got three gigantic fish heads, but they were really plain. I’d advise you to order additional teriyaki sauce for them. The only other dish that’s worth mentioning is the Sashimi Platter. It was pretty, it had great assortments, and they were fresh! If it was the only dish we ordered, our judgment could’ve been slightly better. The final verdict: There was nothing that made me want to return to the restaurant. Everything was a disappointment, except for the Sashimi platter. However, I am curious about the special menu that they offer. Sushi Samurai is part of a restaurant chain, called Excellent Group, and there are several restaurants owned by this group all over Sydney. I had a glimpse of the one in Neutral Bay and it looked so much better and more spacious than the Pyrmont one.